One of the things I noticed most during a springtime visit to Great Britain several years ago is the national passion for gardens. From palatial English Heritage sites to terraced houses with yards the size of hankie, flowers, plants and trees overflow. From Elizabethan knot gardens to the modern Royal Botanical Gardens at Kew, Britons love their gardens. And with good reason: they are sources of beauty for everyone who sees them. However, before supermarkets and drugstores, households great and small depended on their gardens for food, medicine, recreation and ironically, privacy. Evidence from Egyptian tomb paintings indicate that humanity was planting ornamental gardens by the time recorded history began, but the most practical use for gardens has always been to grow food. In 1631, William Lawson in The Country Houswife’s Garden advises careful housewives to plant artichokes, cabbages, kale, carrots, garlic, leeks, onions, pumpkins, radishes and strawberries in the kitchen garden, bordered by “herbes…comely and durable”. The herbs weren’t used just in seasoning food. In Lawson’s day, medicine depended on herbs and most women had a store of recipes for everything from arthritis (a paste made of rose petals) to worms (horseradish or powdered fern root). The physician, if you were lucky enough to have one at hand, would also prescribe such things as lavender oil for faintness, or, I suspect less successfully, for heart palpitations or dissolved in water for ‘palsy’. As well as medicines, the lady of the house would make cosmetics and personal grooming aids in the still room (so called from its use distilling oils and extracts from plants). Oil of rosemary was used both to prevent baldness and in a ‘hair-wash’ considered especially good for dark-haired women. Their blonde sisters used an infusion of chamomile. Apparently redheads were out of luck, unless they chose to dye their hair brown with the extract of boiled walnut shells. Despite their practicality, the kitchen and herb gardens were generally planted out of sight if at all possible. 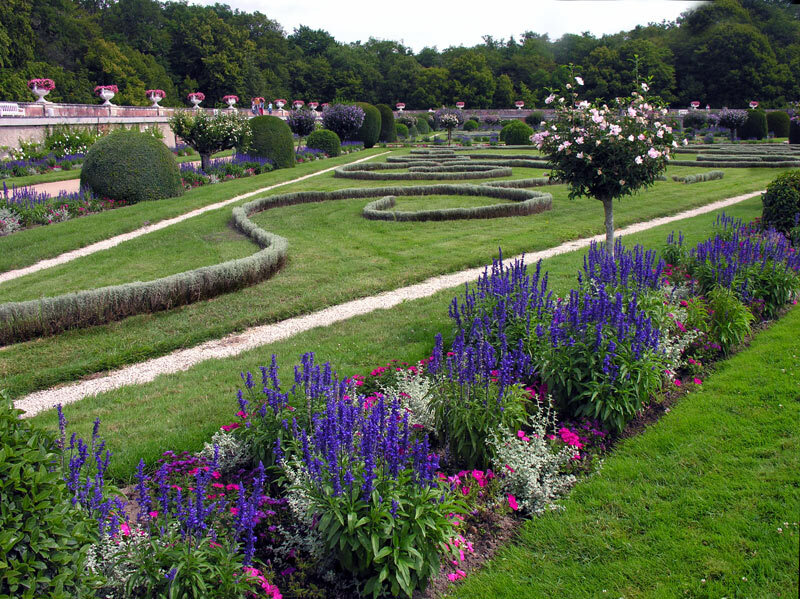 Even the middle classes much preferred attractively planted parterres of blooms, if possible with a lawn beyond. One could stroll among the flower beds or read, and exchange confidences with trusted cronies away from the ears of household servants. The lawn could be used for outdoor meals (served on tables with the good china and silverware, of course) or perhaps a pick-up game of cricket. In cities, this urge for green was answered with public spaces by the Victorian era, such as Hyde Park and Regent’s Park in London or Bath’s Royal Victoria Park (now the Bath Botanical Gardens). Then, as now, city dwellers could enjoy open space filled with grass, trees and flowers, perhaps before going home and enjoying a fresh tomato from a container garden! In spite of my black thumb, I enjoy visiting all kinds of gardens with my honey, who is pretty good at growing plants and flowers. What’s your favorite kind of garden – large and stately or cozy and full of flowers (or veggies)? What a lovely springtime article! It gets one itching to get out and plant–or at least, try to find a tulip sprouting! My favorite garden was a backyard across the street from Maggiie Wolff’s house in Billings MT. The lady’s husband died and she transformed her yard, with tiny grass plains amongst mounds of flowers and fountains and gazing balls. A backyard symphony of color! I’ve never seen anything like it since. I hope that lady still tends her handiwork there. How pretty! She must have been good at design as well as raising plants. And you’re right, I’m itchy to get outside and enjoy looking at gardens even if I can’t grow things.